Henri Honoré d’Estienne d’Orves, the “first martyr of Free France”, fell to German guns at the Fort du Mont Valerien on this date in 1941, along with two companions. A Catholic nationalist naval officer, d’Estienne d’Orves found himself in Egypt in June 1940, when his government capitulated to the devastating German blitz. Eschewing the accommodationist crowd, d’Estienne d’Orves made his way first to a fleet in Somaliland, and then around the Cape of Good Hope and up to London, to link arms with de Gaulle’s Free French government-in-exile. 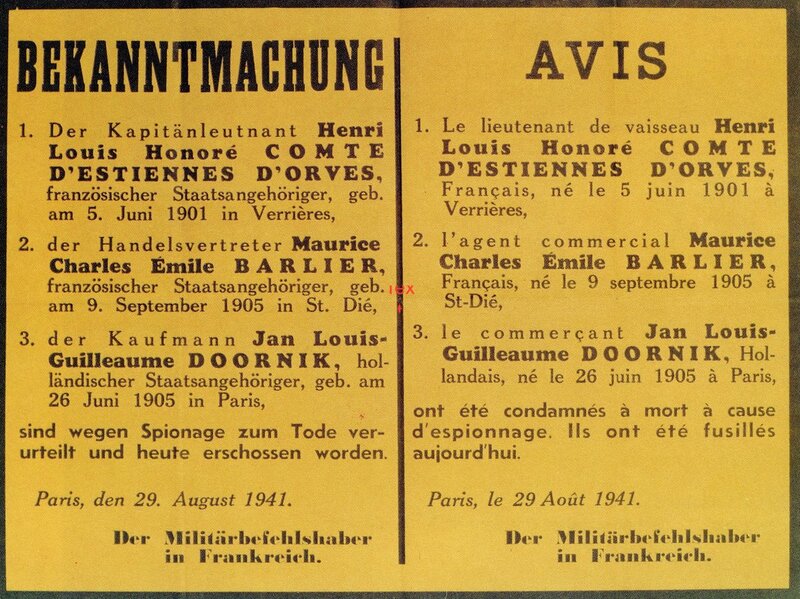 By December of 1940, he’d infiltrated himself into German-occupied France to set up a spy network. By January of 1941, most of the network had been arrested by the Gestapo. 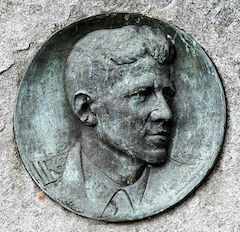 He and eight others were death-sentenced on May 13 and although the German brass entertained the possibility of clemency as their tribute to an honorable fellow-troop, the growth of partisan attacks against the Reich throughout that summer* eventually dictated a more punitive course. D’Estienne d’Orves, Maurice Barlier, and Jan Doornik were fusilladed together, disdaining blindfolds. 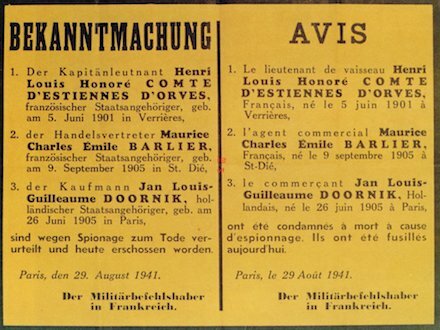 Proclamation in German and French announcing the August 29, 1941 executions of Henri Louis Honore d’Estiennes d’Orves, Maurice Charles Emile Barlier, and Jan Louis-Guilleaume Doornik. * Germany’s invasion of the USSR in June 1941 forced European Communist parties — and very notably the formerly reticent French Communists — into violent anti-Nazi resistance.